Right now, the Fourth Landing Site Workshop for the Mars 2020 rover mission is happening. It’s the last one, and in a few hours the scientists attending the workshop will vote on which of four sites they think the rover should land. I love the geology, but mostly I love one little corner of geology: where the rocks meet the atmosphere. I like how studying the rocks can teach us about how the atmosphere, and therefore the climate, has changed over time on Mars. 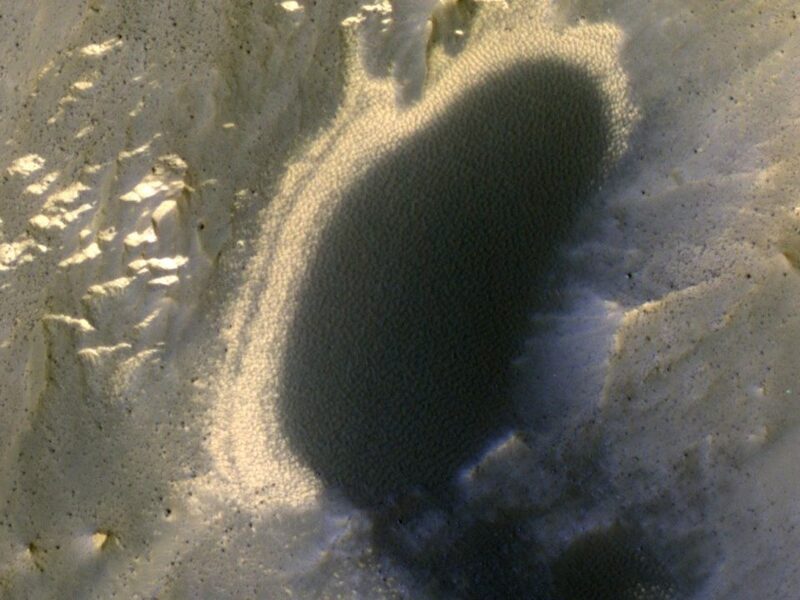 There are signs of windblown things pretty much anywhere you look on Mars, and since none of the landing sites is within range of an actual dune field, I’m not really partial to any of the proposed sites. 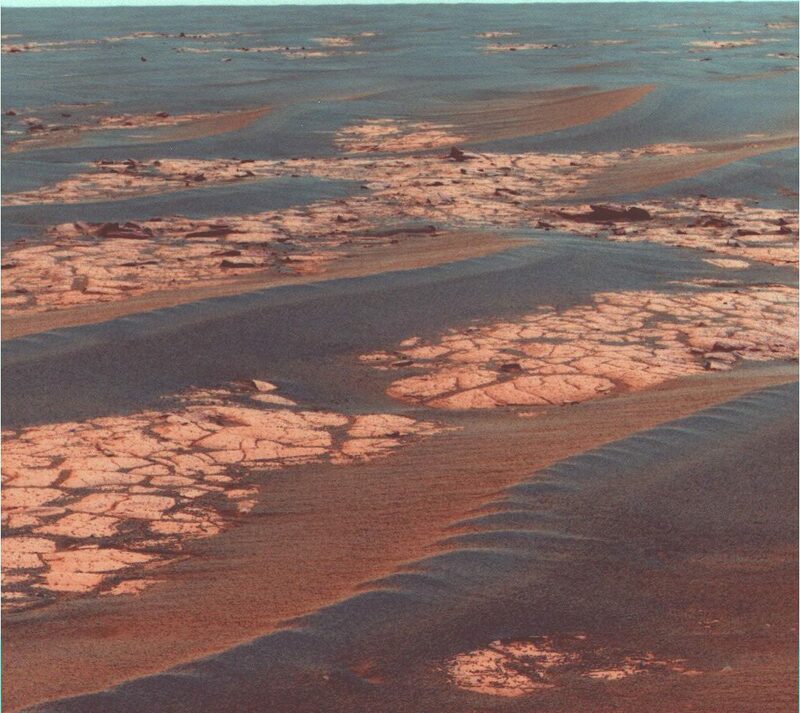 One of the proposed sites is in Gusev crater, taking us back to where the Mars Exploration Rover Spirit went. 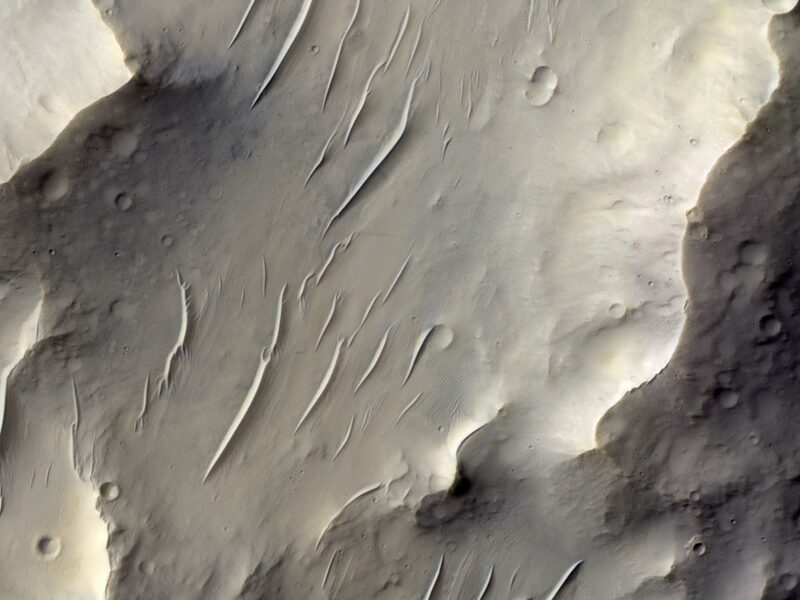 That would be great – they obtained a lot of nice time-lapse imaging of dust devils there, and it was the first place where active ripple migration was observed. The other three proposed sites are in and around Jezero crater, where there are some really nice fluvial features that formed billions of years ago. We can see them because the wind has eroded some of them away, exposing layers and other features so that they’re really great geological study sites. I’m not at the workshop (wish I were tho). But those who are there are tweeting about what’s going on at #Mars2020LSW. Yesterday they must have been talking about megabreccias, because Ryan Anderson (@Ryan_B_Anderson), who is there, tweeted a HiRISE image of megabreccia in Toro crater. That’s what caught my eye. Because wind. View from JMARS of Toro crater and the three proposed Mars 2020 landing ellipses near or in Jezero crater. Toro crater is about 40 km (25 mi) across, located in the northern hemisphere tropics. It’s about 340 km (211 mi) west of Jezero crater. That’s too far for the rover to reach, so I’m not showing you anything the rover will be able to get to. And once they pick a site I’ll find some neat windblown features in it to gawk at in future blog posts. But for today we have something really special to see in Toro crater. Here’s a closeup view of a small bit of Toro crater, near the crater’s central peak. Small portion of Toro crater’s floor, near the central peak. View is 625×350 m (0.39×0.22 mi). Image credit: HiRISE PSP_007767_1970, NASA/JPL/Univ. of Arizona. Annotated version showing bright breccia, bedforms, and “PBRs” (periodic bedform ridges). 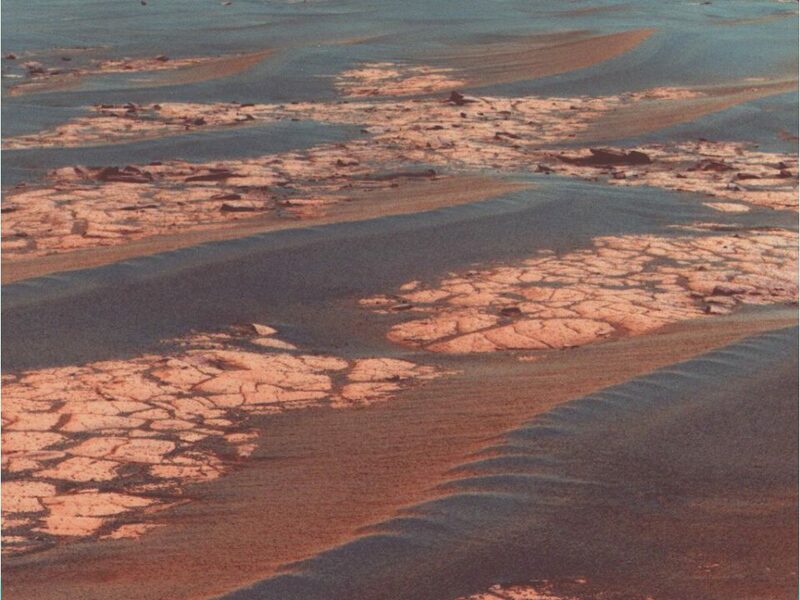 The brighter surfaces are rocks that used to be a few kilometers below the surface of Mars. The impact that formed Toro crater dredged these rocks up and broke them, which is why they are full of fractures. The dark stuff filling the fractures is probably rock that melted during the impact and filled all the cracks, before it solidified into glass. The combination of the bright broken rocks in a darker matrix is called a “breccia”, and it’s commonly found where Bad Things have happened. You would not want to have been standing on Mars in this spot the day Toro crater formed. Likewise, on Earth, breccias are typically found in landslide deposits. Breccia can form where the ground moves quickly enough to break up the surrounding rocks. What’s even cooler is that the bright rocks are made of hydrated minerals. So they’re rocks that had their mineralogy altered by water running through them. Underground. Billions of years ago. And then *boom* a big impact happened (3.6 billion years ago) and brought some of them up to the surface where we can see them. 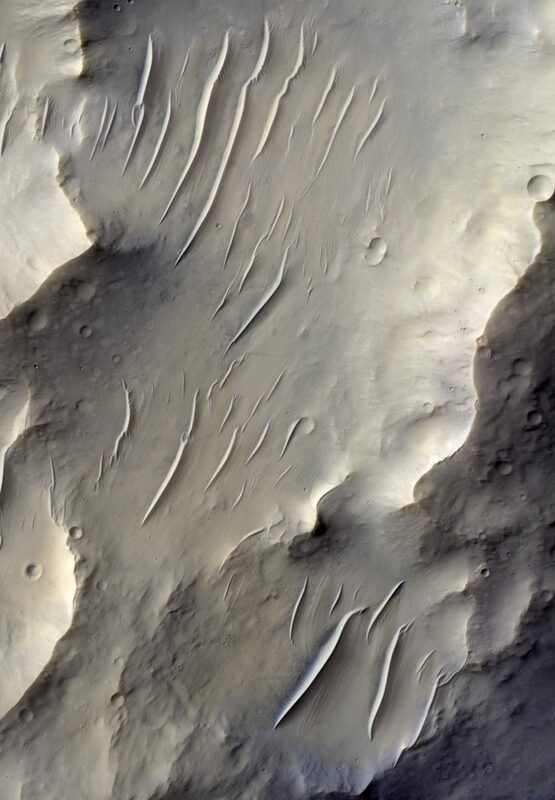 So just by looking at pretty pictures from space, we can see clear evidence that a lot of water moved through Mars’ crust, ages and ages ago. That’s pretty sweet. The linear dark things I’ve labeled “bedforms” are Transverse Aeolian Ridges , or TARs, which are windblown deposits. We’re still trying to decide if they are ripples, dunes, or maybe something new that deserves its own name. But next to the TARs, about the same size, and pointing in the same direction, are similar shapes that are clearly cut into the breccia. They’re not bedforms like TARs, because bedforms are made of small grains that the wind leaves behind and sculpts into lovely shapes. But they seem to be related somehow to the darker TARs that are next to them. So PBRs, I think, are formed by wind erosion. They might be the sites where TARs once stood. It’s been proposed that forming TARs involves not just the wind dumping grains in pretty piles, but also the wind scouring the surface inbetween those piles. And if those TARs ever erode away themselves, they’ll leave behind a TAR-shaped scoured surface that we then call a PBR. Marzo, G. A., A. F. Davila, L. L. Tornabene, J. M. Dohm, A. G. Fairén, C. Gross, T. Kneissl, J. L. Bishop, T. L. Roush, and C. P. McKay (2010), Evidence for Hesperian impact-induced hydrothermalism on Mars, Icarus, 208, 667–683, doi:10.1016/j.icarus.2010.03.013. 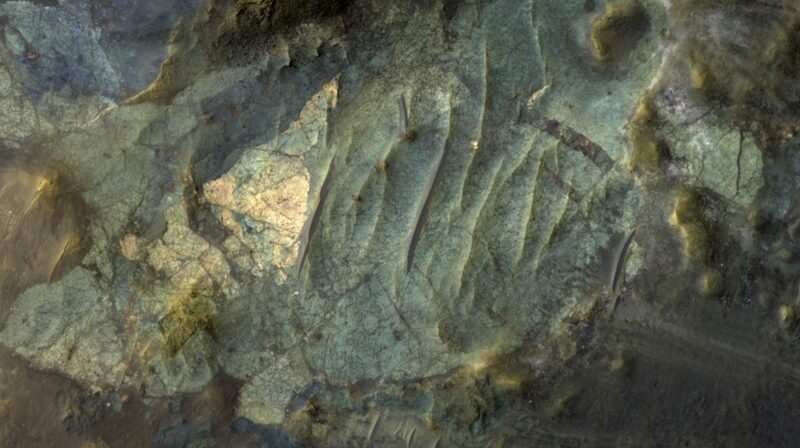 Montgomery, D. R., J. L. Bandfield, and S. K. Becker (2012), Periodic bedrock ridges on Mars, J. Geophys. Res., 117(E3), 1–12, doi:10.1029/2011JE003970.